Using playsets called Mementos, the Player can create her character with Passion enough to crawl out of the grave and accomplish an all-encompassing Drive. The Narrator is responsible for creating the obstacles that will stand in the Player's way. Revenant is released under a Creative Commons Attribution-NonCommercial-ShareAlike license. This PDF is available for free and may be freely distributed under the terms of its license. You are encouraged to come up with Mementos of your own to share with other Narrators. We also offer you the option to Pay What You Want. 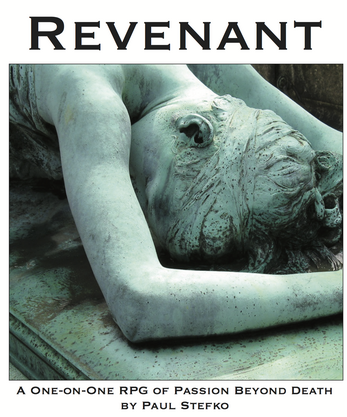 If you like Revenant and would like to throw us a little money for it, please enter whatever amount you think is fair. This is an experiment, so we'd be very interested to have your input.